This luxury cabin SITS ON TOP OF THE MOUNTAIN! Enjoy the beautyof the all wood interior of this stunning cabin. Vaulted ceiling, 4 bedrooms, 4 1/2 bath plus a children's special sleeping area. The cabin has one king with en suite bath, three queens and the children's sleeping area a set of bunk beds. Also outfitted with a walk-in shower. Two Queen bedrooms are on the main floor along with a small room with a set of twin bunk beds, perfect for the kids. Upstairs is master king bedroom and another bedroom with a queen bed. Find all the ingredients of fun in the spacious game/media room. Watch TV on the large flat screen or just hang out with your friends or family while playing indoor shuffle board. The beautifully equipped kitchen has everything the cook in the group would need. Enjoy the Hot Tub with a view, outdoor gas grill and dining table to enjoy dinner with a view. Our cabin was extremely clean and very nice. This is my second stay with Great Smokey Cabin Rentals, and it won't be my last. The property was great! When the sun came out we were able to enjoy the amazing view. Your team was extremely helpful and made sure to answer any questions we had before the trip. The cabin is very clean and comes well stocked with things you may need. There are simple directions on how to use the TV's and hot tub. The team at GSCR was extremely helpful and made sure to answer any questions we had before the trip. We enjoyed our foggy and rainy long weekend on Sunset Ridge. We started a puzzle only to realize all the pieces were mixed among the other 5 boxes. Fear Not! We rose to the challenge and righted the wrong! A long soak in the Hut Tub was our reward! Thank you for sharing your lovely cabin. Absolutely magical! Three generations of family and friends here! Really loved this beautiful cabin and the amazing view, even when raining and foggy - then we would sit around the fireplace! Hope to return again! Sunset Ridge is beautiful, spacious - the perfect mountain getaway! It also has all the amenities of a hotel stay - shampoo, dishes, towels, linens, hairdryers, etc. The team members were friendly and responded to questions quickly. Our family and I had a great time.in the cabin we even spent new years there and we will definitely be going back! he kitchen had everything we needed! The team members I spoke with were very nice and helpful. 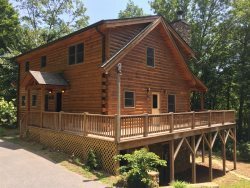 We chose Great Smoky Cabins Rentals because they had the perfect cabin for our family. My favorite feature was definitely the VIEW, our first night in the cabin we saw the most beautiful sunset and of course we were able to capture it. Also the location of the property is spectacular. This cabin is beautiful with tons of space for 10+ guests. The mountain landscape view from the deck and hot tub is fantastic, I would go outside just to gaze at fog rolling in. Cabin is beautiful, appears to be new construction within the last 2-3 years. Everything worked properly and the hot tub was placed perfectly for great mountain views. We had a great time! Did some hiking at the Great Smoky National Park. We loved the Christmas Tree!! The cabin is beautiful! We hope to come again next year! Our Thanksgiving in the Smokys was perfect. The view from the front porch was spectacular! We had a great time in this cabin! The Hot tub was placed perfectly with the view, especially at sunset!! It was nice and cozy! Full of fun memories with hiking and all. the shuffleboard was fun. I've never played that. GSCR communications were fantastic, The cabin was perfect in every way! We loved the view and location and enjoyed our vacation! We were there for a girls weekend and it was a gorgeous spot! The kitchen is stocked with every cooking item you would ever need to put together a fabulous meal. The hot tub and fire pits are perfect for unwinding. We were very impressed with the property and Im already thinking of when I can get back there! We loved the view! Had a wonderful stay here in Bryson City. Weather was absolutely beautiful. The cabin was perfect for the 9 of us with all the amenities provided. So much fun! What a fantastic cabin! We LOVED the cabin and will definitely come back again. The view was awesome, the house was clean and tidy, well equipped kitchen and everything was new. I highly recommend this place. great cabin. We have had an amazing vacation here! Celebrating Birthdays, a 58th wedding anniversary and a 41st wedding anniversary. We have enjoyed the porch and the rockers, enjoying the amazing view, especially the sunsets! This cabin had everything we needed. We hope to come back! This cabin is It was absolutely amazing!! The view and the house was wonderful too. Absolutely beautiful! Our stay was great. The house accommodated our group very well. The view was absolutely beautiful. The house was comfortable and welcoming. We did not want to leave. We chose GSCR because we wanted a beautiful place and one we could trust as opposed to Homeaway and Airbnb where you take you never know what you may get or if the property really exists. We had a great time! The view is amazing!